Many companies teeter regarding offering internships. Much of this uncertainty arises because organizations are skeptical about whether it’s a good use of time and money. By approaching the idea of an internship program with the intent of using it as part of a succession-planning process and as a training ground for new hires, I believe companies will find that it can be a key component of the recruitment process. At my company, it’s important to us that our employees fit and understand our culture — and that goes for our interns, too. We feel that the future of any company is weighted heavily on the people that work there, and our team looks to promote within our organization for the best results. A well-developed internship program can help jumpstart that promotion process. I established my commercial construction firm in 1995. Currently, we have more than 100 employees. But it didn’t start out that way. We grew our team carefully and strategically through a very selective interview process. In doing so, we have ensured everyone on our team fits the mold of our core beliefs as a company. In any industry, it’s important to identify those who go above and beyond what is required. It shows dedication to the job and a willingness to work. This could mean taking the initiative to learn the technical skills needed for a job. When an intern takes the step to educate himself or herself in the daily skills needed, it not only helps them in the long run but can also help the company. This can be assessed in a number of ways from the employer’s perspective. Before the interview, the employer needs to have a solid understanding of the parameters of the job and what competencies are necessary. Once those are determined, the employer can task the intern with specific tasks to accomplish. You can tailor specific questions to the individual intern to discover if they possess those various skills or not. The key concept is knowing how to listen to what the intern is saying and asking follow-up questions when necessary. It’s important that an intern feels a fit with your company and seeks to build relationships with clients and co-workers. The willingness to communicate and get to know your co-workers can ultimately help make them part of your second family. • Can you please provide an example of a team that you have participated on and what your role was? • Have you ever been part of a team that did not succeed in meeting a goal? If so, why didn’t it succeed, and what did you do to improve the outcome? • What role do you usually have when you’re on a team? Creating this selective interview process and utilizing a structured internship program has helped our company see considerable results. We have found that setting requirements for our interns has not only shown success on our end but on the student’s end as well. We also have college interns spend the summer receiving on-the-job training and mentorship under experienced professionals, which allows them to get the most out of the experience. Typically, I’ve found that these students continue to work in the field for several years down the road and build on the challenges and tricks of the trade. Pairing an intern with a mentor can allow them to focus on reaching a goal rather than being rotated around various departments with no ultimate outcome. As a result, the intern is treated more as an employee, which can drive determined students to put the pedal to the metal and run projects of their own to prove their impact for a company. In our program, we pair students with our construction industry professionals. If a student wants to become a project manager, you can partner them with someone in a similar position, such as a superintendent or project manager, to shadow daily. In addition to attending weekly meetings and working directly with that contact, these interactions can provide the intern with a real-world view. Once they leave the company, they can return to their educational institution and apply that knowledge successfully. I have found that it helps clear up a lot of misconceptions about how things should get done, and the interns are better prepared if they return to work with us. While creating a successful internship program may take time, the outcome is often well worth it. 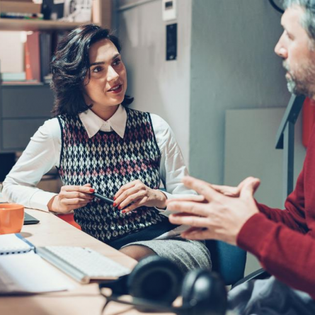 Not only can the younger generation gain real-world experience and knowledge, but your organization could also discover that you are creating a successful career path for future employees.